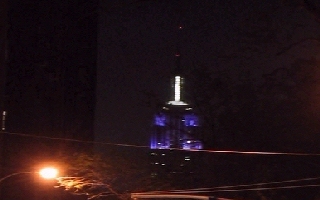 In honor of the NYU Class of 2006 (that includes upper classmates like me and my classmates) the Empire State Building's tower was lit violet and white-- NYU's colors. I thought that was pretty cool. So although I was already in my pajamas when I remembered that tonight it would be lit in honor of our graduation, I ran out to take a photo of it. Luckily I can see the Empire State Building by just walking East three blocks and there it is in between an opening in the sky line. I often stop when I'm on that corner to see what color the lights are that night. But now I can actually check online too since they list the schedule of lightings on the official website as well as the meanings behind each color pattern. My camera however didn't do too well taking a photo of of an object that far away and in the dark. Ah well. I do recommend walking around the meat packing district in silk pajama bottoms and an Italia soccer sweater, holding a camera and passing everyone eating outside at posh restaurants. Definitely an attention grabber whether you want it or not.